With so much to do, see, and experience, it’s no wonder visitors return time and time again to enjoy all that Red Wing has to offer. Whether travelers are planning a winery tour, an outdoor adventure, a romantic getaway, a girls/guys getaway, or a family trip, Red Wing is more than just a travel stop, it’s a destination! Explore the sample itineraries below to help you get started planning your next trip, or use them to build your own personal travel plan. 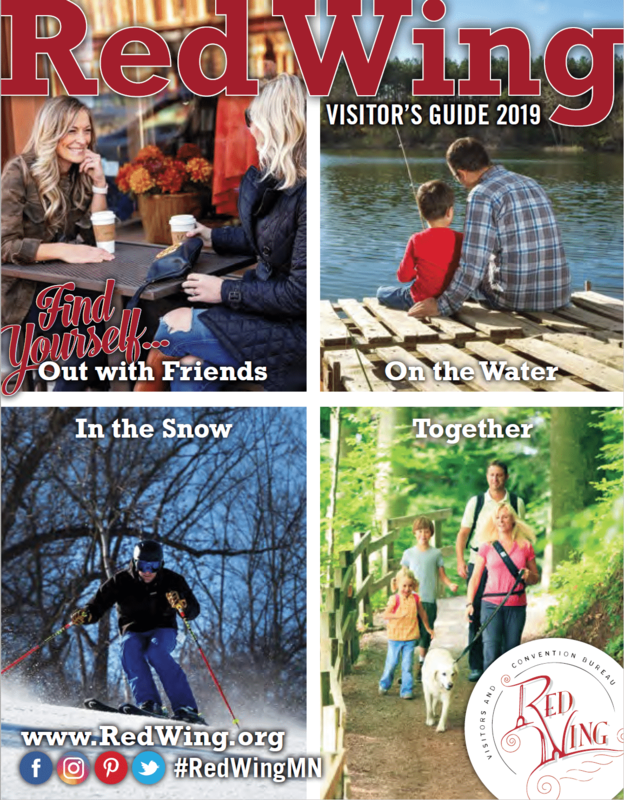 Consultants at the Red Wing Visitors Center, as well as local business representatives, eagerly invite you to the City of Red Wing and are happy to assist you with your travel planning. Let Red Wing add its charm to your plans for romance! Retreat to one of our quaint B&Bs or the historic St. James Hotel and allow yourselves to be swept away by the elegance and intimacy of the Victorian Era. Our local wineries, chocolatiers, and florists will be happy to assist you in creating the perfect atmosphere. Stroll together through our quaint downtown, exploring the antique shops, galleries, cafes, and city parks along the way. Or perhaps you’ll spend your day together exploring the bluff summits, spellbound by the same vistas which once inspired the famous writer Henry David Thoreau. Whether your adventure together takes you through the town or through the nature trails, a massage at Refined Skin Medi-Spa is the perfect way to continue your romantic retreat together. As the sun goes down, you’ll enjoy dining and entertainment opportunities, such as live music at one of our local pubs or a theater production at the historic Sheldon Theatre, affectionately referred to as the “Jewel Box of Red Wing.” Let Red Wing become your destination for romance, and you just may find yourself returning time and time again! Red Wing lodging offers everything from a taste of history to the coziness of locally owned establishments to the assurance of national chain lodging. St. James Hotel: An award-winning, landmark hotel offering everything for a getaway to remember. Warm, inviting rooms loaded with amenities to 3 restaurants for every taste. Elegant, Old World style, plus first-class cuisine and service. Candlelight Inn: Step back into time at this elegant Victorian bed & breakfast. Golden Lantern Inn: This luxurious bed & breakfast near downtown is the former home of the founders of Red Wing Shoes. Features include whirlpool suites, fireplaces, package specials, and mid-week discounts. Moondance Inn: This 1874 mansion features whirlpools in all guestrooms, gourmet food, and a convenient location. Pratt-Taber Inn: Experience this restored B&B with historic Old World charm, where new memories await you. The Pratt-Taber Inn is just steps from downtown and has a view of Barn Bluff. Add that special touch to your romantic retreat with a visit to one of Red Wing’s spas. Specialists in tension-relieving techniques will help melt away everyday distractions and heighten your focus on each other. Wave Spa: Relax together through the luxury of a massage. Other offerings include spa packages, facials, and salon services. Refined Skin Medi-Spa: Conveniently located inside the St. James Hotel, this spa offers an oasis within an oasis. River Blu Salon & Dayspa: Located in the St. James Hotel, this salon welcomes walk-ins, offering hair care, mani/pedis, facials, and waxing. It’s been said that the way to the heart is through the stomach. If that’s true, then the variety of cuisines available in Red Wing are sure to please! Choose from elegant multi-course meals, artisan pizzas, pub burgers, and more! Red Wing Brewery: Authentic handmade pizza and pre-Prohibition energy will make for a light-hearted date night! Oliver’s Wine Bar: Offering wines, beer, nibbles, comfort food and luscious desserts, Oliver’s is the spot for an elegant, yet casual, evening out. Raise your glasses to amore and explore together the rich flavors of the Red Wing region. Visit the countryside and stroll together through flower gardens and flourishing vines as you take in a scenic valley sunset. Or retrace the steps of saloon sweethearts down the historic brewery district. Cheers! Flower Valley Vineyard: The surrounding river bluffs create a perfect scene of romance and relaxation as you delight in tasting the original wines of the vineyard. Falconer Vineyards: Staff members happily guide you through the current selections of their award winning wines. The vineyard often features musical performances on their deck throughout the season to add to your experience. Red Wing Brewery: If you and your date prefer a growler to a glass, be sure to visit this hometown brew house. The Red Wing Brewery features historical beers from the city’s past, in addition to the brewery’s own hand-crafted ales and root beer, guest beers, wines, and spirits. The stage brings an air of amorous magic, whether it’s the experience of being inside the theater, the anticipation that builds before the curtain is drawn, or the energy of musicians making their sounds come alive. Red Wing’s readily accessible live entertainment scene can easily be added to your romantic itinerary, or spontaneously enjoyed as you find live music mingled with dining, wining, and other outings. Sheldon Theatre: Located in the heart of downtown Red Wing, the Sheldon Theatre brings the best of local, state, regional, and national entertainment to its stage year-round. Built in 1904, this historic performing arts theatre showcases music, dance, drama, and children’s performances throughout the year. It underwent renovations in the 1980s to restore its original “jewel box” appearance. The Sheldon’s presentations of music, dance, drama, comedy, celebrations, and classic films are sure to be a highlight of your stay in Red Wing. Hobgoblin/Stoney End Music Loft: The music loft offers a regular schedule of folk, Celtic, and bluegrass music, plus an occasional stage show. It is the home base of Soapbox Players, a local theater troupe devoted to performing creative, socially relevant shows twice a year. There’s something for everyone at Hobgoblin–peruse our antique instrument museum,visit our workshop and watch Stoney End folk harps being made, enjoy a live performance in our music loft; or even host an event! Sales of Celtic instruments, books, accessories, and more. See the website for more information and events. Jimmy’s Pub at the St. James Hotel: The British-style tavern offers live music every Friday night. Marie’s Underground Grill & Tap House: Enjoy a variety of live entertainment presentations, from acoustic sets to stand-up comedy. Red Wing Arts Summer Concert Series in Central Park: Slow down with a stroll through nostalgic downtown Red Wing, and there you will find yourselves at the bandshell where you can enjoy live music on Wednesdays. Bring your blanket or chairs and a picnic basket for a memorable Red Wing summer romance. Check our calendar for a schedule of performances. Falconer Vineyards–Music in the Vines: Regional musicians will add to your experience at the vineyard. Staghead: Local musicians play Thursday, Friday, and Saturday evenings while you enjoy great food. Oliver’s Wine Bar: Have a glass of wine and listen to great local musicians. Treasure Island Resort & Casino: The resort’s two venues offer great concert, comedy, and sporting events, including some of the best names in national entertainment. Why settle for ordinary when you can find extra-ordinary gifts of affection at one of Red Wing’s unique shops. From edibles to collectibles, our local retailers will be happy to help you find the perfect gift for your extra-ordinary someone! Hallstrom’s Florist and Sweet Shoppe: Let a fresh bouquet of flowers speak romance for you! Have them delivered to your hotel as a surprise, or come to the store to choose your blooms and peruse Hallstrom’s fine chocolates and unique gifts to accompany your bouquet. Red Wing Arts Gallery and Gifts: Featuring a continually changing selection of original creations from regional artists, the gallery offers the opportunity to find a one-of-a-kind piece of jewelry, ornament, print, and more. Uffda Shop: This fine Scandinavian gift shop offers a selection of intriguing gifts, including Finnish hand lotion, stunning crystal pieces, jewelry inspired by ancient Viking art, and more. Red Wing Pottery & Stoneware: A collectible piece from the first name in pottery doubles as both a lovely gift and a memento of your romantic getaway. Featherstone Pottery: For a unique, handmade piece of pottery, Featherstone Pottery is the place to go! Take your romance to the river with one of the nearby excursion options. From a leisurely cruise upon an old-fashioned paddle wheeler to a sailing charter, your ideal river cruise awaits you in Red Wing! Spirit of the Water at Treasure Island Resort & Casino: Enjoy a unique experience cruising the beautiful Mississippi River! Treasure Island’s 100-passenger cruise liner will take you on a relaxing two and a half hour tour down the Mississippi while you sit back and enjoy the sights. There are a variety of cruise and catered dining options, including brunch and dinner. Gem Sailing: Voyage together and enjoy the beauty and tranquility of sailing on Lake Pepin and the scenic Mississippi bluffs. Actively participate in sailing the boat or simply enjoy the ride. Gem Sailing is just a short drive into neighboring Lake City. Sail Pepin: Sunny afternoons. Elegant evenings. Dreamy starlit nights. Take a turn at the helm or just relax and enjoy the ride. The friendly crew at Sail Pepin, located in nearby Pepin, WI, will be happy to assist you in making this romantic adventure truly memorable. Daily departures for afternoon, sunset, and starlit sailboat rides, plus sailing instruction, corporate/youth team-building programs, and weddings, family, and business events on beautiful Lake Pepin. Located on Pepin’s charming waterfront. Red Wing Marina: If you want to be on your own, rent a pontoon boat from Red Wing Marina and take the helm for your self-guided tour of the river. Sharing interests is a sharing of the heart. Let Red Wing’s many museums and galleries spark your curiosities as you explore together the array of exhibits, including pottery, stoneware, military, shoes, marine motors, and ski jumping. Red Wing Arts Gallery & Gifts: Located in a 1905 railroad depot on the banks of the Mississippi River, the gallery shows feature a continually changing selection of original artwork. Goodhue County History Center: Established in 1869, the Goodhue County Historical Society is the first county historical society in Minnesota. Permanent exhibits cover such topics as agricultural and rural schools, geology and archaeology, Native Americans and immigrants, the military and law, government, and medicine, business and industry, sport and Red Wing Pottery. The History Center also has an extensive research library for genealogical and historical research. Visitors can also enjoy programs detailing Goodhue County’s rich and vibrant history. Red Wing Shoe Company Museum: Undoubtedly, the biggest attraction in this gallery is the world’s largest boot, an astounding size 638 1/2D! The museum tells about the history and heritage of Red Wing Shoes, including interactive displays and original Norman Rockwell paintings which were used in advertisements. Red Wing Marine Museum: The newest addition to the city’s museums listing shows off marine memorabilia, exhibits, and about three dozen marine engines in its historic waterfront building. Pottery Museum of Red Wing: Operated by the Red Wing Collectors Society Foundation, the museum houses an extensive collection of stoneware, dinnerware, art pottery, vintage photographs, and more. Preserving the history of the clay industries in Red Wing, this museum has more than 6,000 historic pieces of stoneware, art pottery, dinnerware, and folk art to view and enjoy. American Ski Jumping Hall of Fame: Red Wing was the birthplace of ski jumping in America, and is now the place to keep the history of the sport alive. Displays feature artifacts celebrating the 1928 and 1936 National Championships, which were held in Red Wing. Aliveo Military Museum: This special museum is dedicated to the memory of all men and women who proudly served and protected their country. The organization protects, preserves, and presents military artifacts such as weapons, uniforms, insignia and badges, flags and equipment, from eras spanning from the Revolutionary War to the current wars in the Middle East. Honor those who have served by stepping back in time and exploring international military memorabilia and history from all over the world and throughout many different time periods. Historic Walking Tour of Red Wing: Journey together on a self-guided tour through Red Wing’s architectural past. The walking tours are laid out in connecting loops so that you can complete one, two, or all three areas at one time. Maps are conveniently included in an informational brochure so you will be able to learn about the details which make Red Wing’s builds and sites so impressive. 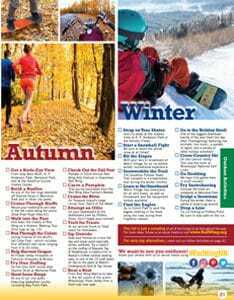 Brochures are available online at https://mn-redwing.civicplus.com/424/Historic-Podcasts or at the Visitor Center. Our dynamic artistic and cultural scene offers something for everyone. With a wide spectrum of subjects, media, styles, and eras, Red Wing captures the attention of all types of enthusiasts. Visit a gallery exhibit, tour a museum, catch a theater production, listen to live music, walk the streets lined with architectural attractions, savor the creations of local chefs, brew masters, and wine makers, and enjoy a distinctive hospitality experience by staying in one of our quaint B&Bs or at the one-of-a-kind historic St. James Hotel. Explore the links below to begin planning a visit to enjoy the artistic and cultural scene in Red Wing. In fact, you may need to plan two visits so you don’t miss a thing! Stay: Immerse yourself in all that is unique about Red Wing by overnighting in establishments you cannot find in any other city. Bed & breakfasts are a popular choice as travelers seek a more personal connection to their vacation destinations. Our local B&Bs honor the integrity of both the atmosphere and the antiquity of Red Wing. If you prefer a traditional hotel setting, the St. James Hotel is the perfect combination of style, sophistication, and comfort. St. James Hotel: This award-winning, landmark hotel has been home to travelers since 1875. For more than 140 years the St. James Hotel has been specializing in guest accommodations and today it continues by offering you modern luxuries such as warm, inviting rooms loaded with amenities, as well as 3 in-house restaurants to appeal to every taste. Elegant, Old World style, plus first-class cuisine and service is the St. James Hotel’s tradition. Candlelight Inn: Step back in time at this elegant Victorian bed & breakfast. The Candlelight Inn features authentic details such as stained glass windows and quezal light fixtures. Golden Lantern Inn: This luxurious bed & breakfast near downtown is the former home of the founders of Red Wing Shoes. Moondance Inn: The Moondance Inn is an 1874 mansion located near the downtown district, where sightseeing, shopping, touring, and dining opportunities abound. Pratt-Taber Inn: Built in 1876, the Pratt-Taber Inn has been restored, showcasing gorgeous woodwork and elegant décor. The Pratt-Taber Inn is just steps from downtown Red Wing, where there are fabulous sightseeing, shopping, touring, and dining opportunities. Meal time is an important part of any itinerary. Travelers will discover that Red Wing appeals to a variety of palates, from regional cuisines set before you to vintage building architecture to surround you. Staghead Gastropub: The Staghead Gastropub offers diners handcrafted, locally sourced meals and a unique list of craft beers. Smokin’ Oak Rotisserie & Grill: You will enjoy the unique flavor of wood-fired rotisserie meats and a full bar. Farmers Market: Partake in the agritourism movement and experience Red Wing’s culture and community by visiting our Farmers Market. You will find the freshest locally grown produce and farmstead products, goods which represent traditions and skills that we value as part of our way of life. Find locally-grown food, fresh bakery, and artisan crafts in Red Wing throughout the year! June – October, 8AM – 1PM, our large outdoor Saturday market at the Depot is bustling with vendors, music, food trucks, and kids activities, as well as offering EBT/SNAP. Sunday – Friday we are set up outside City Hall. Our market moves inside the greenhouse at Sargent’s Nursery November-April on Saturday 9AM – 12PM. Enthusiasts will discover history and art intertwined throughout our city. From new pottery masterpieces created using traditional techniques to fresh acts performed in historic venues, Red Wing offers a hybrid experience for the cultural traveler. Red Wing Arts: Red Wing Arts features two galleries and a gift shop full of local artists’ creations. They are located inside the historic depot in downtown Red Wing and are a great source of information regarding annual events and festivals throughout the year. Goodhue County History Cancer: From prehistoric life to today, visitors can learn about the natural and cultural history of Red Wing and its surrounding area. The meseum offers more then three floors of exhibits and activities, including rotating special exhibits. Highlights include archaeological finds, an extensive military collection, a blacksmith shop exhibit, a research library for genealogists, scholars, and students, Indian mounds, and a one-room school house, just to name a few. Anderson Center for the Arts: An artist community that attracts artists, writers, and scholars from all over the world, the Anderson Center is located at the historic Tower View Estate. Highlights include a world-class permanent collection with works by Picasso, Miro, Klee, Dali, and other masters. Visitors are welcome to walk the trails or bring a picnic to the 15-acre outdoor sculpture garden. Hobgoblin Music/Stoney End Harps: Hobgoblin is a museum/arts hybrid. In the workshop you can witness the artistry of creating Stoney Ends harps, dulcimers, banjos, and bodhrans, as well as a museum of antique musical instruments to awe and amaze. Hobgoblin Music is internationally known for their expertise and craftsmanship so, if you have an interest in musical instruments, include a trip to their historic barn on your Red Wind itinerary. Pottery Museum of Red Wing: Preserving the history of the clay industries in Red Wing, this museum has more than 6,000 historic pieces of stoneware, art, pottery, dinnerware, and folk art to view and enjoy. Visitors are encouraged to walk through the museum to see how the clay industry evolved and why pottery is so collectible today. Come check out our beautiful gift store and take your photo by the world’s largest jugs! City Parks:Red Wing has 38 community and neighborhood parks throughout the city, many of which carry an historical and/or artistic element of interest. Central Park in the heart of downtown was the original location of Hamline University, which was the first institution of higher education in Minnesota, and now showcases the Summer Concerts in the Park series in its bandshell. Levee Park on the riverfront is home to the somber Sea Wing Memorial, as well playful bronze statues located throughout the park. Barn Bluff offers you the experience of walking in the footsteps of the famous writer Henry David Thoreau, who was inspired to write about the beautiful vista views atop the bluff. As you explore Barn Bluff, you will see the 1882 G. A. Carlson Lime Kiln, another example of Red Wing’s blended historical and artistic cultural landscape. Memorial Park, atop Sorin Bluff, comes with the notable significance of being at the center of Minnesota’s limestone quarrying past. Bay Point Park is where you will find the historic Boat House Village, where one of the only remaining “gin pole” installations is located. Rumor has it these gin poles were used during Prohibition to hide bottles of liquor underwater. This village has provided limitless inspiration for artists and photographers. Whether you’re an entertainer or audience member, Red Wing offers you live performances and festival activity all year long. From concerts to stand-up comedy and full-stage theater productions, from nationally recognized headliners to local favorites, our entertainment scene is lively and enticing. Sheldon Theatre for the Performing Arts:The Sheldon was originally built at the turn of the 20th century and underwent renovations in the 1980s to restore its original “jewel box” appearance. It is gorgeous–inside and out–historic, and intriguing. Annie Sheldon’s wish in 1904 was that this theater would be a beautiful building as well as a welcoming place, providing entertainment and enjoyment for all generations. Become a part of the tradition and add a show at the Sheldon to your Red Wing itinerary. Hobgoblin/Stoney End Music Loft: The Stoney End belief is that great music is a beautiful experience worth celebrating. The third level of Hobgoblin’s iconic barn is a dedicated entertainment space, known as the Music Loft, where area folk artists entertain and audiences go for unforgettable fun. Falconer Vineyards: Monthly music events take place throughout the summer and fall in a series known as “Music in the Vines.” The entertainment takes place in the wine tasting room, an intimate space for just 35-40 people. The “house concert” style gives people a chance to meet the artists, as well as to enjoy their music. Entertainment in the Pubs: Kick back, relax with a specialty brew, and enjoy the live local scene hosted by one of our pubs, tap houses, bars, or lounges. Jimmy’s Pub at the St. James Hotel features live music from regional artists every Friday night. Marie’s Underground Grill & Tap House keeps a varied line-up with stand-up comedians, open mic jam sessions, live bands, and even karaoke. Be sure to check our calendar of events when you visit for an updated announcement of acts at Jimmy’s, Marie’s, and other venues as they book gigs. Fair Trade Books: Open mic at Fair Trade Books is a chance to take the microphone and share a song, spoken words (such as poems), or comedy in front of an audience. The atmosphere welcomes you to share your talents, or simply share your company as an audience member. The acoustics are great inside the building, with an ambiance perfected by the old wood and tin ceilings. Be sure to check our calendar of events to take advantage of open mic night during your visit to Red Wing. Red Wing Arts Summer Concert Series in Central Park: On summer Wednesday nights, grab your blankets, chairs, and picnic basket and find a place in front of our beautiful bandstand in Central Park. An outdoor public concert experience is a wonderful addition to your itinerary. Treasure Island Resort & Casino: Treasure Island offers multiple venues, including the Parlay Lounge which highlights the local music scene, as well as the Island Event Center which offers headlining performers in the 3,000 seat arena. In July Treasure Island hosts a celebration of Native American culture and history through traditional food, art, music, and dancing as artisans, dancers, and drummers come from all over the United States and Canada for Prairie Island’s Annual Pow Wow. The Mississippi River has undoubtedly shaped the character of Red Wing, from the breath-taking natural beauty of the bluffs and river wildlife, to the advantages of being a port city at a time before railroads and highways crossed the region. At the heart of Red Wing lies a respect for the river and a gratitude for the bounty it has provided. As the barges continue to travel up and down the Mississippi River, one can appreciate the industrial importance of the waterway, and as the paddle boats cruise with sightseers today, one can appreciate the American tradition kept alive on these waters from the Victorian Era. Kayakers and fishermen can be seen enjoying the river on a direct level, continuing the close bond that keeps the people and the river interconnected. Spend some time on or around the shores of the Mississippi River or the water channels that connect with it to truly experience our river town heritage. Mississippi Paddleboats: Witness the grandeur of large paddle boats, such as the American Queen and Queen of the Mississippi, as they dock at Levee Park periodically throughout the summer. Joining them this year will be the American Duchess and the Louisiane. 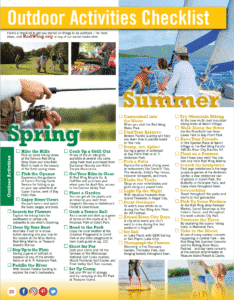 Our calendar of events will keep you informed of planned stops in Red Wing. River Cruising: Treasure Island Resort & Casino provides a relaxing ride down the scenic Mississippi River upon their beautiful 100-passenger yacht, Spirit of the Water. Enjoy a brunch, lunch, or dinner while you cruise. Sailing: The nearby Lake Pepin portion of the Mississippi River offers a unique geological topography which, in combination with the constant breezes descending down through the valley, makes this area a sailing destination. (source: Mississippi-river.org) You can experience the thrill of sailing Lake Pepin by reserving a pleasure cruise or by signing up for lessons with area charters such as Sail Pepin and GEM Sailing. No boys allowed! From traditional retreats to full-throttle adventures that redefine “feminine,” women will find Red Wing the perfect place to celebrate their bonds. We’ve organized a few sample itineraries to get you and your gal-pals started! Stay: Size matters with a travelling bridal party. Consider booking multiple rooms at of one our B&Bs to enjoy a sense of sisterhood, or lodge together under the fairytale-like Victorian charm of the St. James Hotel as a precursor to the bride’s upcoming big day. Perhaps a playful late-night is just what the group needs to unwind before the wedding bells ring; in that case, Treasure Island Resort & Casino offers you lodging, meals, and entertainment so you can be carefree! For groups up to 12, Windbeam House, a vacation rental in nearby Hager City, might be just the thing for a girlfriends’ getaway. Raise a Glass: Depending on the personality of your group, you may decide to visit one of our wineries for a private wine tasting session. Flower Valley Vineyard and Falconer Vineyard both offer regional varieties to suit an array of palettes. Oliver’s Wine Bar, with a nice blend of unique and comfort food, along with fabulous desserts and a variety of wines, offers an elegant choice. Relax: Let Red Wing whisk the wedding worries away! Refined Skin Medi-Spa offers a “Girls’ Night” special for up to 6 guests, including discounts, refreshments, and appetizers. Wave Spa at Treasure Island Resort & Casino is another destination for pure relaxation. Services range from facials to salon services to spa packages. Make your spa appointments in advance to ensure a worry-free weekend for the entire bridal party. Or treat yourself to a mani/pedi or other service at River Blu Salon & Dayspa. Live Entertainment: Be sure to check our calendar for frequent updates to live-entertainment listings in the Red Wing area. From local favorites performing most weekend nights at our taverns and pubs to the nationally-known stars playing at Treasure Island, you won’t have to look far to find a night of dancing, laughing, and fun for your bridal party! Stay: Signature warmth and hospitality by one of our family-owned B&Bs will make Red Wing your home-away-from-home. Let your hosts do the cooking for you, and the dishes, too! With garden spaces and intricate interiors, you will find yourselves surrounded by specialness. Dining Out: Lunch at the Veranda will give you a perfect excuse to add a distinctive St. James flavor to your Mother-Daughter itinerary. The Veranda offers 3 settings under 1 establishment: the Porch (where you can enjoy coffee or appetizers from over-sized rocking chairs), the Patio (bringing you the cool river air to complement your meal), and the Hoopskirt Bar (because a Bloody Mary with Mom is a memory in the making). Bev’s Café is a small-town, full-service restaurant well-known for its home-style comfort cuisine. Or perhaps a trip to Falconer Vineyards & Winery would be ideal, where together you can savor regional wine, wood-fired pizza, and picturesque views from the patio bistro. Raise a Glass: From craft-root beer at the Red Wing Brewery and milkshakes at Bev’s Café to Starbucks or chai tea at Clara’s Café to a glass of wine among the vines of one of our vineyards, Red Wing can provide a setting for sipping just right for mothers and daughters of all ages. Relax: Bring Mom to Fair Trade Book Store to pick up a favorite read for the café or park. While you are downtown, enjoy a leisurely stroll along the quaint streets of Downtown Red Wing, beautifully adorned dozens of hanging flower baskets or wander through the flowerbeds in the city’s many parks. Does Mom have a green thumb of her own? Perhaps perusing the floral aisles at Hallstrom’s or Sargent’s Nursery will be her bliss. Or enjoy a creative session together to unwind. Red Wing Pottery offers private wheel throwing classes, culminating in a personal, handmade clay memento as a keepsake from your getaway. Shop: Downtown Red Wing features an eclectic mix of shops. The Uffda Shop is a favorite among tourists (no accent required), as is the Red Wing Shoe Store, which carries a full line of women’s foot apparel, as well as clothing and souvenirs. Antiquing continues to be a favorite pastime across generations and, with shops such as Larry’s Jugs, you just might find that perfect piece to complete a collection … or to begin a Pinterest project together! Live Entertainment: Add a night at the theater to your itinerary for a truly unique and special experience. Shows by award-winning performers inside our beloved Sheldon Theatre take on an extra sense of excitement, a sensation inherent in the gorgeous, historic, and intriguing venue. Bring your blankets and a picnic on a Wednesday evening to the Red Wing Arts Summer Concert Series in Central Park for a night of free musical entertainment. For an added touch of uniqueness, attend a live folk music performance in the Music Loft of the noteworthy Hobgoblin Barn. For those with more spice than sugar, Red Wing has your recipe for adventure! Stay: Treasure Island RV Park welcomes you to overnight. Forget posh quilts; you’ll be nestled in by the scenic bluffs of the river valley. A nearby hardwood forest and miles and miles of horse, bike and walking trails will beckon you and your girl posse to set forth into the great outdoors. Dining Out: No time for salad forks and tea cups? Pop into a sandwich shop for a delicious, hometown-quality panini, sandwich, soup, or salad, or grab a sub to toss in the backpack before you embark. Mandy’s Café and Coffee has an interesting selection of paninis and drinks. Kiki’s Simple Abundance can provide you with organic fruit, protein bars, and granola to keep your energy or choose to stock up at the Red Wing Farmer’s Market, featuring gluten-free breads and other homemade goods. Of course, every girl likes a slice of unforgettable pizza, especially after a hard day of play, and so you will want to add a stop at the Red Wing Brewery to your itinerary to enjoy one of their signature pizza or calzone creations. Raise a Glass: You will want to make a stop at the Red Wing Brewery to savor the craft brews which have been recreated from regional historical ale recipes. Marie’s Underground Grill and Tap House, Kelly’s Tap House & Grill, and Bayside Tap & Steakhouse have a variety of specialty brews in fun environments as well. Directly across the river, Harbor Bar combines a small town watering hole atmosphere with a full line-up of summertime outdoor music festivals. Relax: Some girls find a bubble bath relaxing … and other girls prefer meditation in motion and a surge of endorphins to feel revitalized. Red Wing caters to active enthusiasts, so the only difficulty you and your girlfriends will have with this portion of your itinerary is finding a way to conquer it all in just one trip. Purchase a Wheel Pass and hop on the 19.7 mile long Cannon Valley Trail, which features scenic view sheds to use while you hike, bike, inline skate, or cross-country ski the route. Find serenity in nature by booking a guided kayaking tour through Broken Paddle Guiding. Hiking in Red Wing is another winning choice with trails to such heights as Sorin Bluff (Memorial Park) and Barn Bluff, where you’ll get your workout and an amazing view of the of the Mississippi River and Red Wing below. Need equipment? Red Wing Bicycle Co. & Outfitter has what you need for your adventure. On belay? Forget the footpath and hook up your harness for rock climbing at Barn Bluff. Looking for winter adventure? Get a group pass and take on a shredding session at Welch Village Ski & Snowboard Area, where the slopes satisfy first-timers (lessons available) to seasoned pros. Shop: Red Wing Shoe Store carries a full line of women’s hiking boots, backpacking boots, running shoes, and top-quality gear that will keep you active. Duluth Trading Company can also set you up with clothing and gear for your adventure. Live Entertainment: Entertainers keep Red Wing’s vibe alive into the night. Stop into one of our pubs or tap houses for a night of live performers. Check our calendar for updates to find out what’s happening in town. From country and rock bands to open mic and karaoke, comedy acts to hypnotists, a stage in-house to an outdoor festival, you are sure to find a fun time! Stay: If you’re looking for sophistication and style, look no further than the iconic St. James Hotel. Complete with spas, shopping courtyard, fine dining, and an ambiance of elegance, you and your girlfriends will find yourselves surrounded by luxury. Or join traveling trendsetters who delight in the uniqueness of bed & breakfast lodging, where each property and set of hosts gives a distinctive experience. With whirlpools, gourmet menus, and ornate décor, B&Bs have become the new chic! Dining Out: The Port Restaurant inside the St. James Hotel has held onto its fantastic culinary reputation for years. Its masterful chef creates seasonal wonders every night and, when dinner is paired with award-winning wines from The Port’s cellar, patrons of this Red Wing restaurant experience upscale dining rivaling that of any metropolitan table. The Staghead Gastropub is grabbing a spotlight of its own as one of Red Wing’s newest hotspots. Staghead’s distinction comes from their culinary expertise in preparing handcrafted, locally sourced meals. Raise a Glass: From the carefree air of the Hoopskirt Bar in the St. James Hotel to intriguing varietal flavors coming together in sophistication at Falconer’s Vineyard and Flower Valley Vineyard, Red Wing provides you with occasion to raise your glass extraordinarily. Relax: Refined Skin Medi-Spa, River Blu Salon & Dayspa, and Wave Spa at Treasure Island Resort & Casino have all the right resources to pamper you and your girlfriends from head to toe, including massages, body treatments, and spa packages. Add to your inner tranquility by booking a private yoga session. Shop: Trendsetting girls like you need a place to find fresh styles. Red Wing has become a shopping a destination because of its originality. The line-up of unique boutiques and shops downtown make for a fun attraction to explore on foot. Stop in to the Uffda Shop for a selection of exquisite crystal pieces, whimsical children’s gifts, Nordic sweaters, authentic lefse and krumkake supplies, lotions, and so much more! Cut Above Home features interior décor, and Whimsy’s Closet brings you novel items to add to your wardrobe. Check out the unique cards and scented oils at Kiki’s Simple Abundance, and then step right next door to the Fair Trade Book Store where you will find new and used books on every subject. The Red Wing Shoe Store is a must-stop for the fashion forward. Red Wing boots have taken “function” and created a niche for themselves in the world of “fashion.” The iconic styling of Red Wing boots has become a symbol of American ruggedness, even earning their own Pinterest fashion pins. Duck inside the St. James Hotel to find more shops waiting for you! The Levee will make your shopping trip truly unique with a one-of-a-kind jacket or sweater. In fact, The Levee is Minnesota’s exclusive distributor of Blue Willi’s knits from Denmark. At Vestiges, you’ll find racks of hand-crafted jackets, luxurious sweaters and special denims. Clementine’s is the place to go for fresh flowers. While you are downtown, stop in at the Red Wing Arts Association to shop their gift gallery full of one-of-a-kind, artist-created pieces to add to your home or to share as gifts. Live Performances: Imagine you and your girlfriends unwinding on the patio with a glass of regional wine, a decadent dessert, and the glow of a summer’s evening sun highlighting your perfect evening at the vineyard. Now add the delightful notes of live music to your scene and you have the perfect, picturesque setting to unwind with your closest friends. At Falconer’s Vineyards, the Music in the Vines summer series welcomes you to partake in the sensations of sights, sounds, and tastes as an encompassing experience. Red Wing has a variety of hotels, motels, bed & breakfasts, and camping. To see the current packages and deal, visit our hot deals page. Enjoying hiking on this beautiful bluff, right along the Mississippi River. We recommend hiking up the South Trail. That will take you the the West Outlook. As you’re heading back down the South Trail, you we see a trail that veers off to the left. That is called the Prairie Trail. This trail takes you to the opposite side of the bluff to the East Outlook. The East Outlook is a dead end, so you will have to head back towards the South Trail. The South Trail will take you back to the head off the trail on 5th Street. Round trip, the trail is 2.5 miles long. With its scenic Skyline Drive, visitors can drive to the top of the bluff to catch a spectacular view of the city and to explore. Throughout the park, find gorgeous views of the city as well as many hiking and biking trails, picnic tables, charcoal grills, and a 9-hole disc golf course at the top of the bluff. Several campfire rings are also available to accommodate groups and gatherings. Colvill Park: There are nine gardens that make up the Discovery Garden. The four outside gardens are each planted with two colors: the Ladybug Garden (red/pink), the Moon Garden (silver/white), the Sun Garden (yellow/orange), and the Water Garden (blue/purple). The other gardens are: the Fragrance Garden, the Faerie Garden, the Butterfly & Hummingbird Garden, the Cook’s Garden, and the Rainbow Garden. Festivals:River City Days: August 4th-6th. Click here for a full list of River City Days events. Call 651-245-8369 to schedule a tour. Established in 1869, Goodhue County Historical Society is the first county historical society in Minnesota. Visitors can find exhibits and a full-service research library and enjoy programs detailing Goodhue County’s rich and vibrant history. Open Tuesday -Saturday 9AM – 5PM, and Sunday 12PM- 4PM. Winter hours (October – April): Tuesday – Friday 9am – 5pm and Saturday 9am – 3pm. Closed Monday and holidays. Preserving the history of the clay industries in Red Wing, this museum has more than 6,000 historic pieces of stoneware, art pottery, dinnerware, and folk art to view and enjoy. Come check out our beautiful gift sore and take your photo by the world’s largest jugs! Open Tuesday-Saturday 9am – 5pm; Sunday 11am – 4pm; closed Monday. Follow us on Facebook! Visit one of Red Wing’s oldest buildings which has been transformed into the most unique museum on the Upper Mississippi River. The Red Wing Marine Museum is home to the largest collection of Red Wing Thorobred Marine Engines, as well as other artifacts and photographs depicting Red Wing’s rich river history. Open Saturday during the summer 12PM – 5PM, as well as during paddle boat docking dates and by appointment. 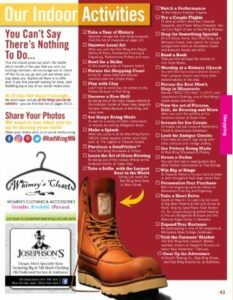 Visit the flagship Red Wing Shoe Store to see the world’s largest book, the Red Wing Museum, and full-floor outlet center. Sculpture Garden and Nature Walk at Anderson Center: With its International Artist-in-Residence program, permanent art collection, exhibitions, classes, and outdoor sculpture garden, the Anderson Center has been named one of the top artistic destination points by National Geographic Traveler Magazine. Visit their website for annual events. Meeting and rental space available.